Baby Papasan Cradle Swing has a whole new look and some great updates to the original. Now there's an attached teether toy and pillow embroidery. The nest-like seat comfortably cradles babies in soft multi-textured materials while rocking in a traditional front/back motion or side-to-side cradle motion. An overhead soothing motorized mobile incorporates three characters, each "flies" with distinct gentle motion in between leaves and around a mirrored globe. A removable tray with bead bars and empty tray space provide plenty of room for Baby's entertainment. 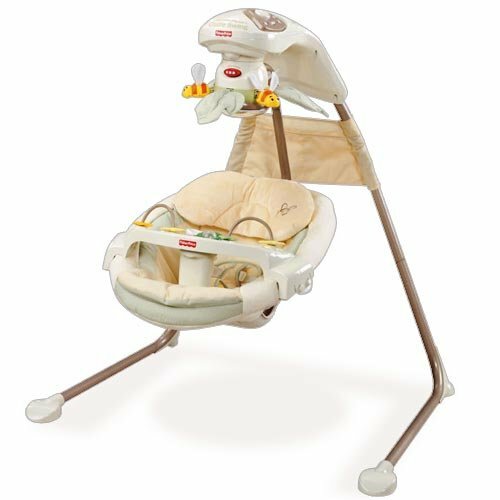 Features: six speeds, 8 soothing songs, gentle nature sounds, infant head support insert, plus two-position seat recline. Folds easily for storage.Requires 4 "D" batteries, not included. Measures 13.5"L x 38"W x 28"H. Holds up to 25 pounds. You can adjust the motion of the swing: side to side or front to back.